Useful Post No.1 or Where do I go shopping?! This is a fabric lovers Mecca! 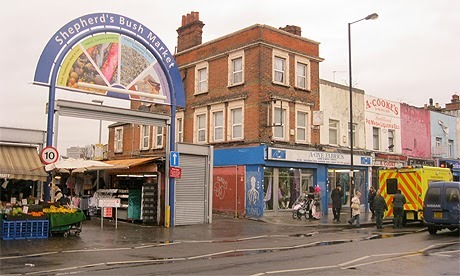 About 15 shops and the market, all right next to Goldhawk Road tube station on the Hammersmith and City line, Zone 2. You can buy pretty much anything here, beautiful silks, Liberty cottons, leather, luminous lycra and sequined fabrics galore and all at really good prices. The brilliant shopkeepers are all extremely helpful and welcome a bit of haggling, this was my go to location for costuming fabric needs and I've sent many happy hours trawling the shops for just the right fabric. A more upmarket version of Goldhawk Road! If you want quality, then this is the place. Several fabric shops are spread along and around Berwick street in Soho, including several specialists in silk. One of my favorites is Borovick fabrics, a fantastic shop that also does an excellent mail order service including a free sampling service. The shops here are definitely more expensive than Goldhawk road, but if you are looking for an amazing, couture level fabric, for a very special project this is the place to go. Always known to me as Whaleys, (from my RADA days darling!) this is an amazing source for plain, mostly white, black or natural fabrics in a vast number of qualities and fibres for dying, printing or just when you need a plain fabric. I once ordered 60m of plain cotton sheeting that I then made into a full chorus of ancient Greek togas! I can't think of many other places you can do that as such reasonable prices. You can buy a complete sample range, which is very useful if you need to order lots, or you can order specific individual samples. I found this online fabric site by chance when searching for a lace motif to put on a friends dance dress. I was quickly hooked! A really wide range of fabrics specifically aimed at the bridal market, including loads of nets and veiling and they have a really fab range of brocades for groom's waistcoats. The colours are all available across the different fabric types, which makes life so much easier when you have a design which has for example, satin and chiffon as you can get both with a couple of clicks-hurray! They have a range of coloured and ivory silks as well, that are well priced. You don't have to have a trade account and can order online, but if you do sign up for a trade account you get even better prices. My favorite part of their range has to be the gorgeous lace fabrics and motifs that they are continually expanding and are very competitively priced. This does exactly what it says on tin! Cheapfabrics.co.uk is a really useful place if you ever need to make panto costumes, you can buy all sorts of sparkly, shiny and above all cheap fabrics here that you would not use anywhere else! Or something that only needs to survive a few shows and that will then never be used again... They also do a good range of cottons and polycottons, both plain and patterned and basic fabrics like calico, that you use a lot in costume work or for toiles. All in all, a very useful site. Well it may be a new year but my health did not get the memo and is still behaving like a stroppy child insisting I have IVs every four weeks... I am back on them for my first set of the year so as I'm not feeling very much like doing anything I have been taking stock of what I want to do in the coming months. Well one major thing that will happen this year is that I am getting married!!!! MR EB is finally making an honest woman of me and we are getting married in June :-) Whilst I am deliriously happy (total understatement!) I now have to organise a wedding-seeing as Mr EB has a proper job and is going to be travelling a lot in the next couple of months, it seems sensible that I get on with sorting things out. However, I don't like organising big events, they usually leave me stressed and grumpy, and I've been involved with the wedding industry for several years now and know just how difficult, not to mention incredibly expensive weddings can get. Fortunately Mr EB and I are in agreement about pretty much everything we want and also that I do not get stressed-phew, good start! Unlike most couples getting married, the first list we made was actually not of what we wanted, but what we did not want! This was really helpful as it meant we immediately lost most of the froth of the wedding industry (I don't need colour matching, monogrammed napkins!) and have cut it down to the bare essentials- we want to get married somewhere nice, but not in church, hopefully in the sun (not much we can do about that!) with afternoon tea and then have lots of really good hog roast-my favorite. There won't be a theme and I can't be bothered to have coordinating everything, we just want simple and fun with people we love :-) At least that's the plan, whether we stick to it only time will tell! So between organising the wedding and making my dress I may not be blogging as much, as hatting and embroidery will have to take a bit of a back seat whilst I beat my dress design into shape and actually make it. It's probably just as well that I am making it myself as I really would be the client from hell! I do want to try and carry on blogging whilst I do my wedding dress tho, so I thought I would try and share some of the knowledge I've picked up over the years. I've not entirely decided what form this deluge of knowledge will form, maybe the odd tutorial (although there are already so many sewing tutorials out there I'm not sure they really need tuppence worth), some of my historical projects might feature or the odd book review... anyway it will be something that will hopefully be interesting and useful to someone somewhere out there in the ether. As well as this burst of informativeness, I am also hoping to have enough time and energy, to complete some of the challenges from The Historical Sew Fortnightly, that is run by the rather marvelously named Dreamstress. This is a brilliant idea, where the Dreamstress sets fortnightly sewing challenges online for the whole of 2014, for historical sewing enthusiasts worldwide to complete and then post about on the Facebook page and their own blogs. It is such a good way to get people interested in costume history and sewing and I'm a bit gutted that I did not know about this when she ran it last year! You don't have to do every challenge (thank goodness), you can do as many as you can manage, or just the ones that interest you. It will be really lovely to do some proper historical costuming again-I've missed doing all the research and unusual patterns and techniques that doing period costume lets you use.